Learning Rocks | the blog of Dan Roddy: A cure for the page/slide hangover? A cure for the page/slide hangover? slides are a side effect of an old unused technology, slide projectors. 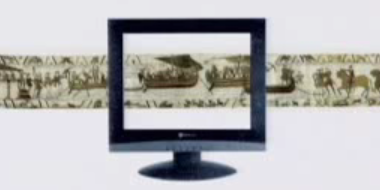 Still, all presentation software today relies on slides. Likewise, most e-learning (asynchronous courseware) still exhibits features of its flat/linear predecessors. This isn't necessarily a bad thing as some very good stuff has been done using those earlier technologies, but the computer screen is not a page or a slide. In fact, it can be so much more. Comic book author Scott McCloud explores this theme in his presentation at TED2005 and shows how comic books have tried to review their relationship to the page/screen to avoid the mistake of carrying an old paradigm forward. McCloud traces how linear graphic narratives such as the Bayeaux tapestry by necessity - cost, accessibility - gave way to fractured, paginated narratives. Then he shows how innovative graphic story tellers are beginning to examine again how to use the limitless space of the computer's memory to create joined up storylines. He emphasises looking at the screen not as a page, but as a window. This is of course commonplace in games design - think of chasing Lara Croft or flying a sim - and as such is gaining ground in learning with the likes of Caspian's Thinking Worlds or people using Second Life as a classroom or even cheap filmset. But based on what I saw at LT09 this week, I would imagine the majority of elearing still uses the page/slide mindset. Much is made of the benefit of tools like mind or concept maps and how they offer an additional visual element to how information is structured, allowing us to interpret their content in a wholly different way. But at their heart most mind maps are simply heirarchical outlined lists, and often computer based mapping tools are very restricted in the options for including graphical elements. Concept maps are often quite complex, showing the multiple relationships between components, but often requiring detailed re-reading to understand and rarely offering the interpreter any guidance on how to follow them - lacking the scaffolding that would help learners of novice content. The Prezi pan-and-zoom technique looks like a good way to resolve this problem. It offers a page/slide-free representation of information; clearly posesses a capacity for a linear path (it's a presentation tool after all) but also allows free exploration; it literally allows the learner to pull back and get an overview of the subject or drill down for greater detail (offering a Mandelbrot or microfiche-like capacity for zooming). I find this novel approach quite exciting. Of course, there's been nothing to prevent this sort of thing being done before in Flash - I saw it in a Casio mobile phone ad a year or more ago - but to try to create this would have been a complex matter and remarkably hard, if not impossible, to get all this specified in a way that designers I've worked with would have been able to interpret well. Prezi is yet another tool that would place advanced creative control in the hands of non-specialists. So, do you think that you could meet Scott's call for casting aside our hangover from the era of the slide and the page - could it be what he calls a 'durable mutation' - or does the convenience of linearity and familiarity mean the page turning model of elearning, for good or bad, will stay with us? Thanks to Jane Hart for the Prezi link, lost in the torrent of good stuff on her PotD.